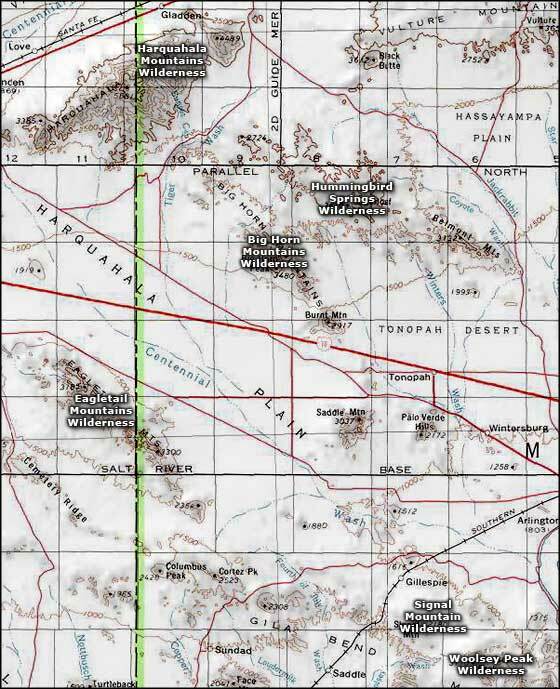 The 21,000-acre Big Horn Mountains Wilderness is in the Big Horn Mountains northwest of Tonopah. Near the middle of the property Big Horn Peak rises about 1,800' above the desert floor. The wilderness area is crossed by nine miles of the main jagged ridgeline of the Big Horn Mountains. Dropping from that ridgeline are small fissures, chimneys and narrow canyons. This is the kind of countryside most loved by Gila monsters, Desert Bighorn sheep, desert tortoises and kit foxes. You'll also find great horned owls, barn owls, prairie falcons, and golden eagles nesting on the walls of the canyons. There are no designated or maintained trails in this wilderness but you can access it via unmaintained dirt roads that stop at the east, north and west boundaries. A lot of rock climbers like coming here because of the multitude of high, cracked walls to practice on. There's no shortage of primitive campsites either. The Hummingbird Springs Wilderness is just the other side of the jeep trail that runs along the northern edge of Big Horn Mountains Wilderness area. Get off the I-10 at either the Tonopah or Salome Road exits. This is where the unmaintained dirt roads head north to the eastern, western and northern boundaries of the Big Horn Mountains Wilderness.